The role of sports stadia and sports facilities as symbolic icons of place/team/sport, as well as significant tourist attractions in their own right, have been discussed several times in this forum. Many teams and organizations now offer behind-the-scenes public stadium tours which, as the growing body of research shows, address numerous managerial issues, including several directly related to heritage. Although the stadium tour has now become quite commonplace, some venues reach a level of global infamy that visitors flock to them – whether they are fans or not. Such is the case with Old Trafford, home football ground of Manchester United. Many clubs and organizations have come to realize that the stadium tour can be the centrepiece of an hours-long heritage and retail experience at the venue. Research conducted at Twickenham Stadium, home of England Rugby, found that venue managers viewed the tour, in part, as a way of driving visitors to retail and catering services (many of which were only utilized on event days) as well as a means of sharing the history and heritage of the venue, team, and organization. Recent visits to both Daytona International Speedway and Anfield (home of Liverpool FC) noted that tours were just one part of a multi-hour visit which might include additional heritage experiences (such as team museums), tour add-ons, and retail opportunities. Simply put, stadium tours have evolved and been professionalized tremendously, and many sites and organizations are using them to drive other initiatives on non-event days. Old Trafford reflects – and, possibly, may have even instigated – this trend. That said, this new tour model doesn’t come cheap. 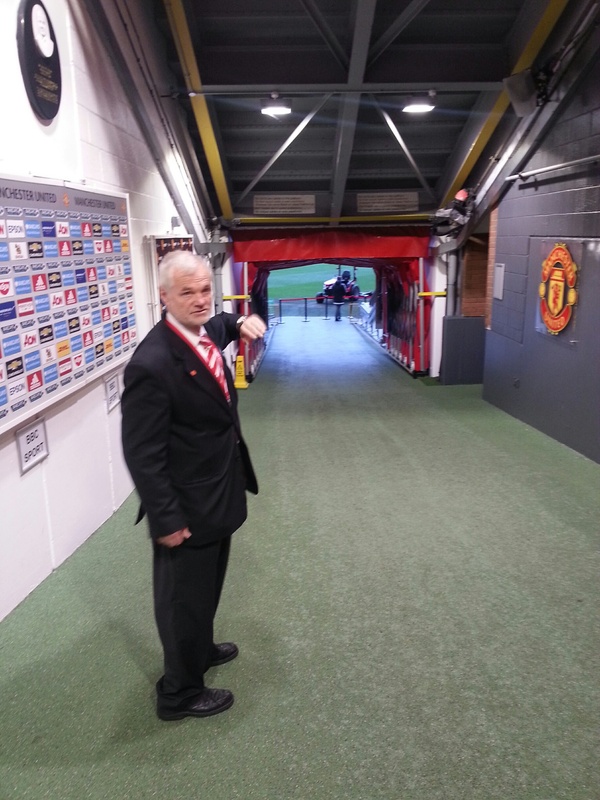 Tours of Old Trafford are £18 (a shade under $30US) which includes a self-guided visit to the team’s museum and a guided tour of the Ground, as well as access to the bar/lounge for visitors looking to have a coffee, beer, or light snack. I will admit, I wish I had much more time to look around the large and very impressive team museum. Full disclosure: I’m not a Manchester United fan, I’m not steeped in its history and traditions, and my interest in English football in general is casual these days, though it was once quite passionate (Newcastle United fandom can quell any flame, I suppose 🙂 . In any event, the team museum is excellent – only rivalled (in my experience) by the now-defunct Montreal Canadiens Hall of Fame. I only wish I had more time to take a good look before the tour began. The tour itself covered familiar territory, going behind the scenes in the dressing room, media room, owner’s suite, and along various views of the pitch. And, of course, the tour ended at the (massive) team shop. The tour guide – John – was excellent. A long-time, local supporter, he brought knowledge, passion, and humour to the hour-long tour. The fact the tour managers went with a local supporter reflects, I think, a particular form of glocalization, in that they provided a “authentic” local voice to a globally-recognized club. Interestingly, the tour reflected the international interest in the club and venue as well, as no one was actually from Manchester (and, I believe, only one was from Britain), while the 25-person tour included visitors from China, Canada, Australia, India, New Zealand, Kenya, and the United States. Even more interesting was the fact that only a handful of tour patrons identified themselves as Manchester United supporters, and some mentioned that they weren’t really football fans at all. 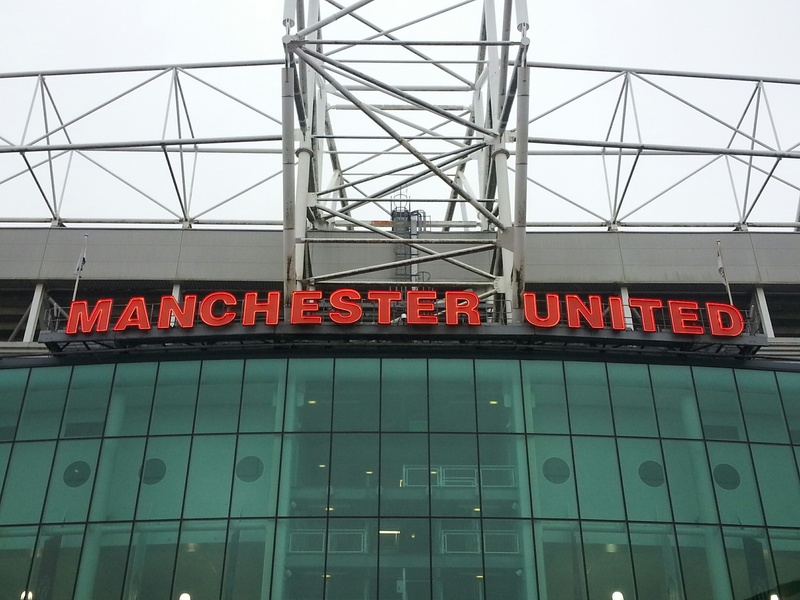 Old Trafford – famous for being famous, indeed! 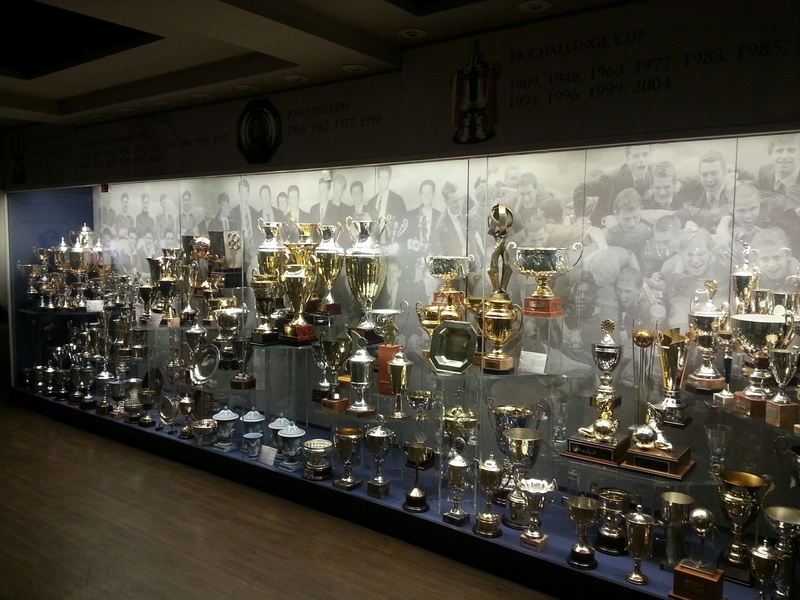 All in all, as a venue tour – and broader sport heritage experience – it was excellent. From a purely practical and managerial side of things, everyone was friendly, polite, and welcoming. The guide’s narrative kept both casual and non-fans engaged, while also dropping enough nuggets for passionate supporters to make it all worthwhile. I think, were I not already casually committed to another club (and, if I didn’t have an almost pathological aversion to massively popular and successful sports teams), the experience probably would have made me think about supporting Manchester United. From an aesthetic point of view, I was actually taken by how worn the stadium is. From the outside, it looks almost like a contemporary NFL venue – but, inside, it is actually (and almost charmingly) frayed. The home dressing room, for example, was fairly spartan. The owner’s suite was nice, but hardly jaw-dropping. It actually made the club, strangely, more relatable. 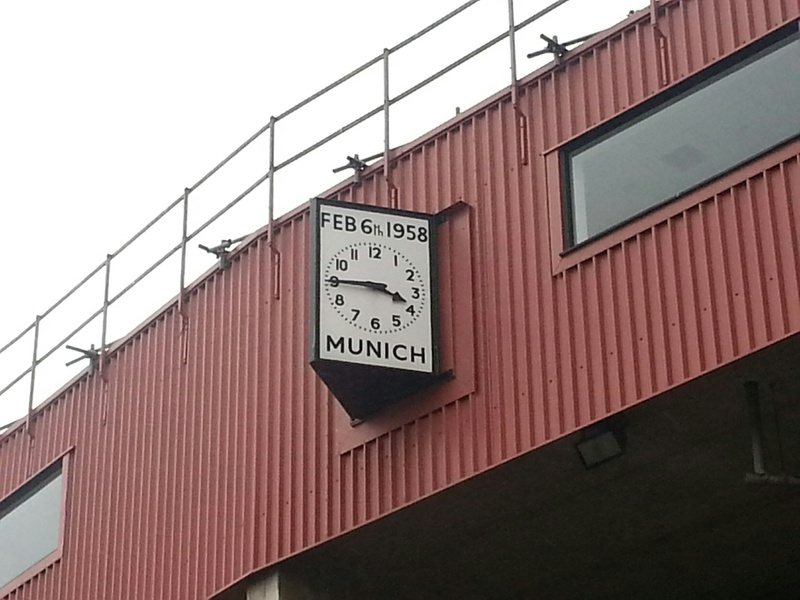 The stadium is also a bit of a monument itself, with the many notes and reminders to famous games, players, and events surrounding the ground, the most notable (and sombre) of which are the dedications to the 1958 Munich Air Disaster which saw several Manchester United players lose their lives. 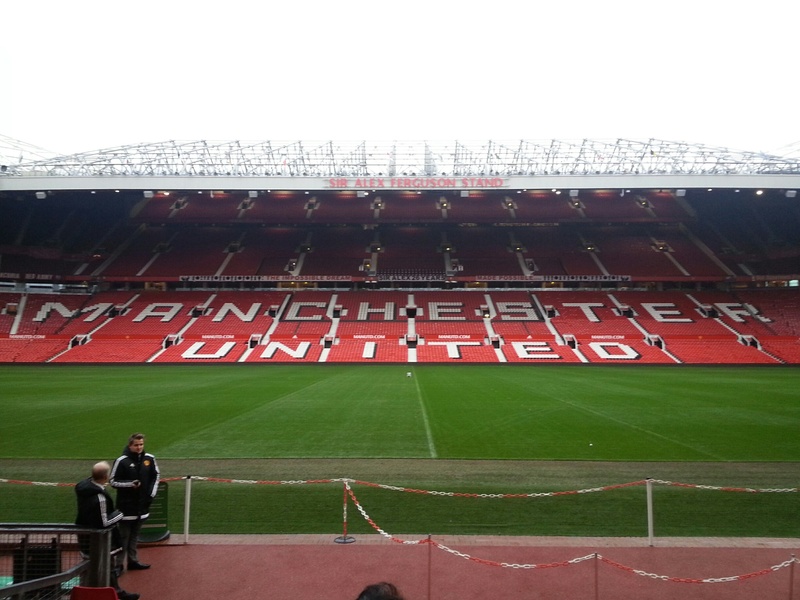 Old Trafford is, arguably, is amongst the most well-known sports venues in the world, and it is part of a seemingly growing trend to make the stadium tour just one part of a larger and in-depth touristic experience. The tour itself was strong, even while following expected tour norms, though it is the operation – and how the history, heritage, and tradition of the club is created, consumed, and commodified for a global audience – that should make sport heritage scholars and managers take pause. Manchester United clearly takes these heritage experiences seriously. By Gregory Ramshaw in Uncategorized on November 12, 2015 .